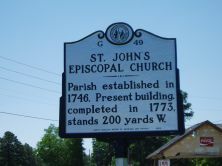 Parish established in 1746. Present building, completed in 1773, stands 200 yards W.
Williamsborough, in modern Vance County, was once a thriving colonial town. 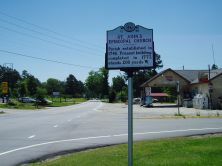 When Granville County was carved out of Edgecombe County in 1746, the Anglican St. John’s Church, originally called Nutbush Church, was established in the new Granville Parish. Once considered a potential site for the University of North Carolina, the Williamsborough was bypassed by the Raleigh and Gaston Railroad by about eight miles. The town steadily declined, though the St. John’s church building, completed in 1773, remained. The original specifications and contract between the church vestry and carpenter John Lynch describe a substantial building of the best-quality workmanship. Ministers at St. John’s include William Mercer Green, John Stark Ravenscroft, and William Shepard Pettigrew. Church attendance dwindled after Pettigrew’s death in 1900. Painstakingly restored in the 1940s and 1950s, St. John’s is the oldest frame church in North Carolina and one of only three colonial church buildings extant. In 1947 concerned citizens formed a group called Friends of St. John’s with the intention of restoring the old church. Restoration was directed by Milton L. Grigg of Charlottesville, Virginia, and was completed in 1956. Bishop Edwin A. Penick rededicated the church on September 30 of that year. The church is used for special services three times each year, including one at Christmas.